Red imported fire ants (Solenopsis invicta) are non-native ants now found throughout the southeastern United States and are present in at least 71 of the 100 counties in North Carolina. Contrary to what their name implies, red imported fire ants are actually a dark reddish-brown with an almost black gaster (abdomen). 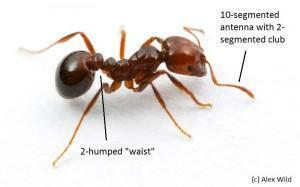 All colonies consist of at least one queen that lays eggs, developing larvae and pupae, and adult female worker ants that tend the young and forage for food.There is considerable size variation among workers, but all workers have a “waist” with two humps, and a ten segmented antenna with the last two segments enlarged like a club. Some colonies have a single queen, and some have multiple queens. At certain times of year, winged male and female ants develop that leave the colony en mass. The males will mate with the new queens, then die. The new queens will then fly to a suitable location, shed their wings, and start a new colony. A red imported fire ant worker. Red imported fire ants may establish nests in strawberry fields. They are especially attracted to areas of recently-worked well-drained soil such as raised beds. While the ants occasionally damage the roots of strawberry plants through tunneling, they usually have little direct impact on the crop. However, their presence can be a hazard to workers in the fields. If their nest is disturbed, fire ants will swarm and sting nearby people. The venom from their stings can result in numerous, tiny blister-like welts and, more rarely, severe allergic reactions. Strawberry plant surrounded by red imported fire ant mound. Fire ants can be controlled in strawberry fields by the application of baits. If infestation pressure is high or over a large area, a two-step approach of broadcasting bait to reduce the number of colonies, then coming back and treating individual mounds that persist (if any) is the best approach. For smaller areas or low rates of infestation, mounds can be treated individually. Refer to the North Carolina Agricultural Chemicals Manual for materials recommended for use against red imported fire ants in North Carolina and the Southern Region Small Fruit Consortium Southeast Regional Strawberry IPM Guide for regional recommendations. Before purchasing baits, make sure the bait is labeled for use in strawberries. Some baits available for use in residential areas or pastures are not labeled for use in strawberries or other crops. Many of the approved baits are insect growth regulators (IGRs). IGRs work by preventing the ants from reproducing, not by directly poisoning the workers. As such, it takes several weeks for control to be achieved. All baits are only effective if applied during warm (65°F-90°F), dry weather when the ants are actively foraging. Check mounds for foraging ant activity before applying. For fire ant control in organic production systems, there are OMRI-approved bait options. 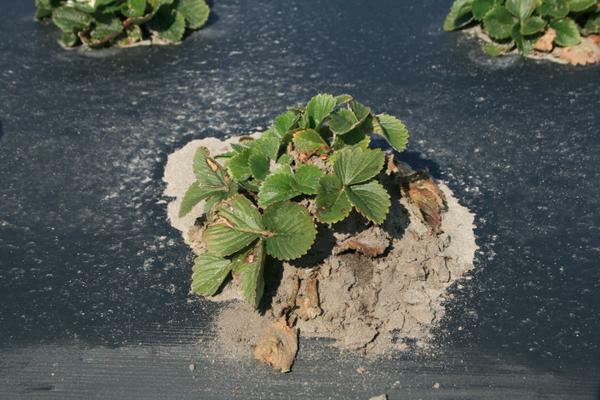 Current bait recommendations for fire ants in North Carolina strawberries are listed in Southeast Regional Strawberry IPM Guide.